If you’re like me, not that I would assume you are, but I forget a lot. True story. Somehow the Lord gave me the wherewithall to be able to manage some pretty large projects and clients, but… I may forget why I went to the grocery store. Or even more often, just after I call someone and it starts ringing, I have to glance at my screen to see who it is I’m calling. But the hardest thing for me to remember is the most important, God’s awesome faithfulness. He’s had my 360 way more times then I’m remotely aware of – and yet, it’s pretty easy for me to get lost in my circumstances, freak out and start focusing all my energy on how I can fix the thing He called me to without Him or on finding the closest Mexican restaurant for a plate of steak nachos. I remember a set of circumstances that sent me through a tumult of forgetting. I knew God was able but I got distracted. I started staring at the waves that seemed to be getting higher and higher. Then came the wrestling. As I laid down to go to sleep one night my mind was filled with anxiety, fear and worry. My heart raced. Breathing was difficult. And rest was just a hope. I laid there, going over and over imaginary conversations in my head. Then as I began to pray I heard so clear and more loud than any of the other voices, “have I not always taken care of you”. It was a calm and loving voice like a father speaking peace to his frightend child. I kept hearing it over and over. I hear the same inflections in my heart as read about when Jesus calms the storm in Mark 4. In hearing those words that morning at 4:30am, I still had a fight ahead of me. I began praying, “yes You’ve always been faithful, yes, You’ve always taken care of me.” The wresteling continued till after the sun had risen, but finally – the peace came and I drifted to sleep. When I woke up to leave for work, a wave at a time rolled over me and I could see the same tempest on the horizon. However, God was still faithful. After the fight the night before and earlier that morning, I knew I was at my end, and while sharing with friend who was encouraging me an answer came to one of the waves that had been overturning my boat. I was overcome with joy, the kind that streams down your face and makes you ugly-cry. By the end of the day all but one of the heavy waves I’d been watching had been shushed by my Father that has always taken care of me. And even with the one unresolved issue, it seemed so much smaller now in comparison, I couldn’t even consider it a wave any longer. It’s just an unknown, that my Dad’s already taken care of. I know we each have stories like this – so how do we remember to remember? 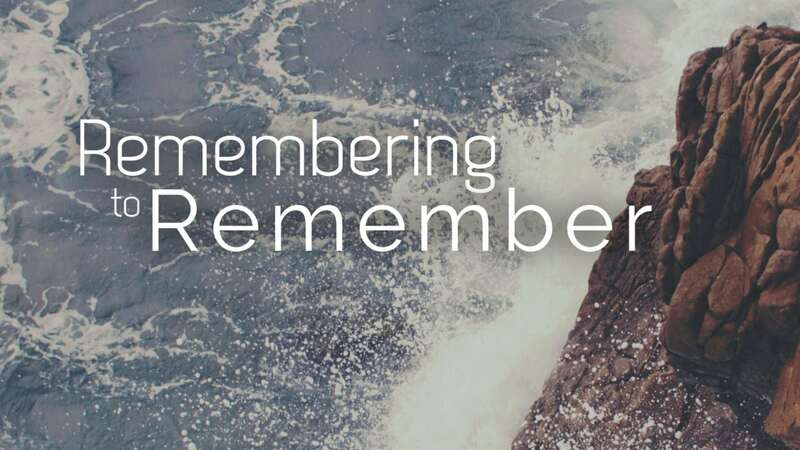 How do you remember? Email me at stories@epiclifecreative.com and tell me how you remember! I’d love to hear!